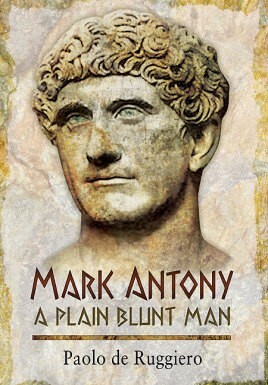 Mark Antony was embroiled in the tumultuous events of the mid-1st century BC, which saw the violent transformation from the Roman Republic to the Roman Empire. After being defeated by Augustus he has often been characterized by hostile historians as a loyal henchman of his uncle Julius Caesar but without the guile and vision to attain greatness in his own right (hence Shakespeare casts him as a 'plain, blunt man' whom Caesar's assassins don't think it worthwhile to kill). In his infamous alliance and love affair with Cleopatra of Egypt he is also often seen as duped and manipulated by a sharper mind. Despite this there is no doubt Antony was a capable soldier. He first saw action leading a cavalry unit in Judaea, before giving valuable service to Julius Caesar in Gaul. He again served with distinction and led Caesar's right wing at the climactic battle of Pharsalus, and he was decisive in the defeat of the conspirators at Philippi which ended 100 years of Civil wars. But Paolo de Ruggiero re-assesses this pivotal figure, analyses the arguments of his many detractors, and concludes that he was much more than a simple soldier, revealing a more complex and significant man, and a decisive agent of change with a precise political vision for the Roman world.